As more and more films come to NYC to record, producers need larger spaces. A new recording service at the DiMenna Center is helping to fill the gap. 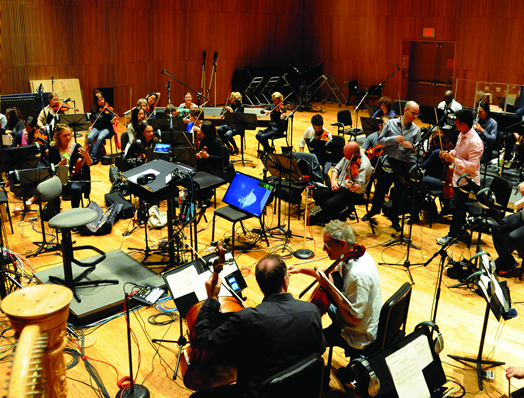 Local 802 musicians record the score to the Coen brothers’ movie “Hail, Caesar!” with Audiosmith Digital Solutions at the DiMenna Center, done under a union contract. Photo by Walter Karling. More productions are taking advantage of the tax breaks offered in New York to record here, which is great news for our musicians. But until recently, New York City has had only two large recording studios: Manhattan Center and Avatar. Now, with the launch of Audiosmith Digital Solutions at the DiMenna Center, New York City has a new premier venue for large-scale orchestral recordings. Audiosmith has installed a state-of-the art control room at DiMenna, and over 100 musicians can be recorded at once in DiMenna’s largest room, Cary Hall. This offers the ability to host full orchestras, choirs, Broadway shows, chamber groups, jazz and acoustic ensembles and more. Any type of project can be recorded, including films, advertising, social media, theatre works and TV productions. The DiMenna Center’s showcase room, Mary Flagler Cary Hall, offers 3,400 square feet and a Steinway D 9-foot piano, a retractable film screen, 5.1 surround sound, skylight windows and high ceilings. It easily holds over 100 musicians. Four recording industry veterans are the partners behind Audiosmith Digital Solutions. Lawrence Manchester is a Grammy Award-winning music producer/engineer/mixer; Isaiah Abolin is a recording and mixing engineer; Jim Flynn is the founder and CEO of Jim Flynn Rentals; and Joe D’Ambrosio manages many top producers, mixers, engineers, arrangers and musicians. In addition to on-site recordings at the DiMenna Center, Audiosmith Digital Solutions will also provide location recording services for concerts and media events locally, domestically and internationally.